Anyways Bon voyage bro! take care & have a nice trip! Hope to see my shoe soon! As you might have known, i'm a sucker for nice sunsets and beaches, i managed to capture a few shots of these sceneries with my zire71 pda. OOohhh I so love the exhilirating views and am glad to experience them. 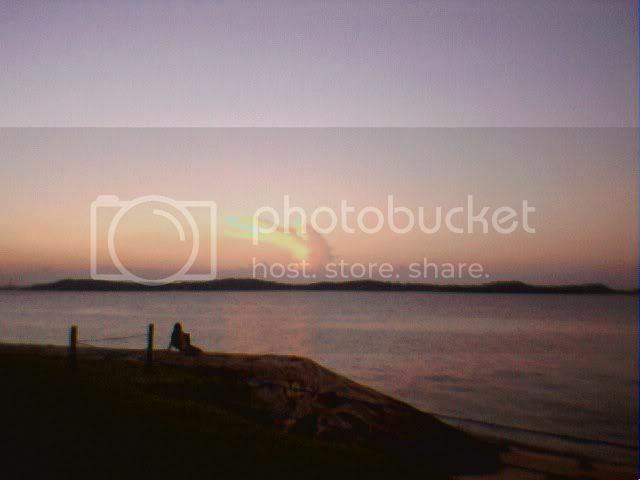 1st pic= This is at Pasir Ris Beach at about 7pm in the evening. There's a queer-looking cloud that looks like...ermm.. well i leave it to u to guess. hehehe. But the fusion of colours is just brilliant. 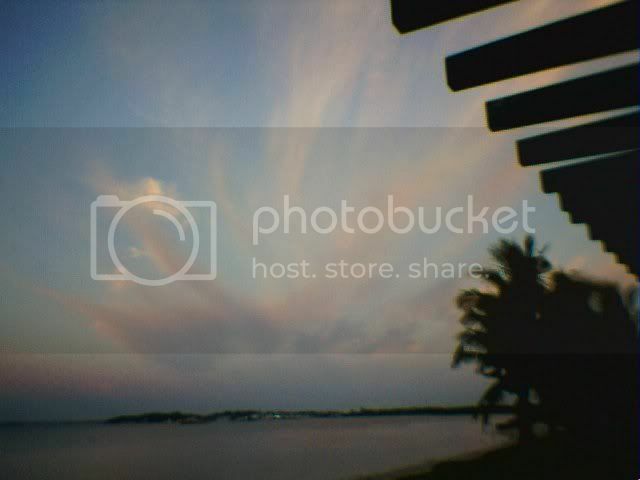 2nd pic= This is also at Pasir Ris Beach around the same time but at a different site. Wispy feather-like clouds cover almost the part of the sky. 3rd pic= Aaahh.. my favourite. 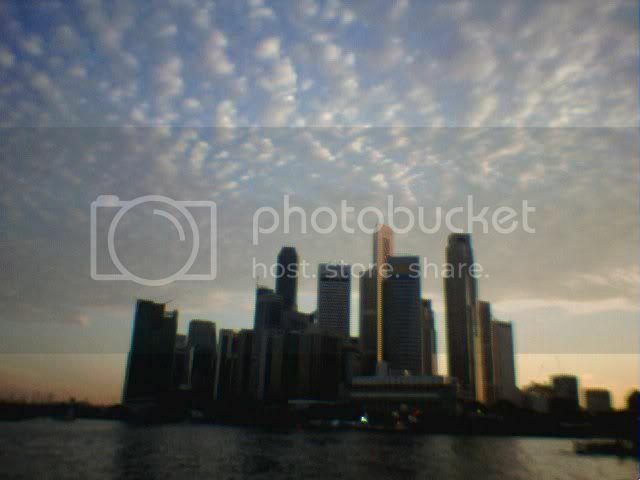 The Singapore skyline at around 6-7pm. I was with BF when i took this pic. We are sitting at the Esplanade by the bay along the stretch of the event stage. The clouds make a tremendously nice effect to the whole background, don't u think? Yea, tell me about it(referring to the title). There's simply no one walking in our shop or neither of the rest of the shops between 10am-1pm. That's life everyday at the air-port during that hour. Anyways i still had fun working everyday. Met Gf after work for some good lunch at Century Square. Eyes was already tired & head starts to spin a bit. I really felt like dozing off while eating. Actually I intend to go home after lunch but then the sleepy feeling vanished. Catching a movie was something I had in my mind. While discussing what show to choose from, 2 malay girls approach us & offered to sell a ticket they don't want to watch. They offered a good price too. So 'The Day After Tomorrow' was the choice. 4 popcorns I'd give! Simply a great show. Watching 'Troy' again one day yea Gf? I like that show! ooh how things have changed in blogger! I'm left with ample time to just post a few words off the top of my head. First of all, yes my pc is still hanging on to a lifeline. It sure is infected with most prolly 5 or so viruses coz a few unknown "installers" suddenly appear out of nowhere on my desktop, labelled, 'infamous_downloader', 'mfc', 'install2','silent_killer'. Those names sure instill fear within me! kekeke. I could have just reformatted or reboot this damn thing-of-a-box, OR i could just have armed myself with an armour and sword and hurl them at the viruses and shout "Boooger Off! Die, you Fking germ! DIE!" But i didn't. It's pretty obvious that i can't solve the problem. Coz everytime i tried, they keep coming back. There on, i yearn for a new pc!!! My Honey's on his way home from work now..I'm so extremely proud of his achievements in bringing sales. He's a people-oriented-person and this has brought him some great words from the boss. Wish i could be like you Honey. He loves his job so much i always hear him smiling on the other line whenever he calls me. yea... i can Hear him smiling.. :) Good for you, my man o'beloved. I'm missin you right now.....this very second. I had such a great time yesterday. Was out the whole day with Gf. We went to Swensens for lunch & also had a great time chatting together as we past our 1 hr slowly~. Gf did lil shopping after that & we wanted to catch a movie but none interest us or the timing is not right. So we went for a walk around town before we made our way to tampy. Bought some stuffs & we later had lil dinner & deserts. Sent Gf home after that. Thanks Gf for the sweet lettter! I love you! Did We Really Stay Unbeaten??.. Met Gf after work today. Gf bought her mum a gym shoe & I bought The Sims expansion pack(Superstar) from Challenger. Not too sure when I'll have the time to play 'cause Zul told me its good therefore I bought it & speaking of my mate Zul, I got him his perfect birthday present. You're going to like it bro. haha..
Today was all fine,pretty happy with the sales & most importantly I'm pretty happy with the experienced I earned from the Nike Concept store. Learnt pretty much more from the Nike Golf. So it'll be a whole new experience again at Terminal 2. Can't wait for that. Anyways have to say sorry to Gf's mum cause` I didn't manage to get her size today. Maybe next time k? Suprise,surprise Wan Haliq visited the shop today. Haha..
Firstly I'd like to say thanks alot to my mate Zul for making the cook out & I believed everyone enjoyed the food alot. Nice to see almost everyone making conversations among each other & as for those who can't make it,maybe next time yea. Anyways today is my first time attached to Nike Wheelock Place. Was attached to Nike Golf instead of the the concept store,jeez whats wrong man,sigh. Anyhow I'd lots of fun there too. Met Gf after that for dinner & we spent sometime windowshopping. Basically I had lotsa fun!! yuPpie!! to convert out our theory acts to practical ones. WIsh me good luck starting Monday! & also there's a cool mini internet cafe, all the best mates! Van Helsing is quite a dope show but nothing still beats Kll Bill Volume 2! Swoosh...Swoosh & more swoosh ..
5 great things that happen in my life since yesterday. 1. Kill Bill Volume 2 was far the best movie I'd watched so far this year. Watched it with Gf,Zul & Fahmie at Jurong Entertainment. 2. Arsenal still remain unbeaten thanks to a goal by spaniard wonderkid Jose Antonio Reyes. It was his first goal in the Epl. 3. My first day at Ekin was extremely great! What a start to my new career(insya'allah). Oh I got quite number of their freebies too!yea hoo! 4. Shezai had bonesteak AGAIN! Twice in a week!! Oh my, fatty Shezai coming up soon!! 5. S.A.F powder does really reduce the itchiness of my foot rot! It all began with the big Robinsons sale at Tanah Merah Expo hall. Gf bought alot of stuffs there but I didn't get anything though. After all those shopping, I accompanied Gf home to put all the things. We then made our way to town area. Alighted at Bugis, we walked around. We intend to watch a movie but really clueless of what show to watch. Went to Bugis GV but they only show 3 shows yesterday. Therefore we went to Shaw & there we chose 50 First Dates, it's 5 mins to the show when we bought the tickets. We rushed quickly to the cinema thinking we were late but there are patrons who came later than us & there were also who came after an hour the show has been screened. Really don't know what's their motive. Anyways I wouldn't say the show is good or bad. From a couple's eye, it's very sweet,romantic & touching but to others it may differ in a way. I'd never missed any Adam Sandler show & I'm a big fan of him, far more than Jim Carey because of the way he acts. Very Simple, Adam Sandler is very laid back with his body language etc etc whereas Jim Carey is like forcing himself to be funny,fullstop One of my many favorite meals was next up for us. Yes, BONE STEAK!! Babarian food I'd love to label it too! haha.. It's Going To Be A Whole New Year,Month & Week To Me Beginning Wednesday 5th 2004 .. I had a great weekend! Starting on friday where my friends(The Pinholes,Effa & Zul) & me hoped for to dine our dinner at The Satay Club but was devastated to see a signboard stating that beginning on 30th May(which is the day we went), they are closing down for renovations. What rotten luc. So instead we opt for an Al-Almeen kind of 24hr restaurant owned by Nazri Nasir. They sold satay there too. I tried the Mee Bandung. Superb dinner & we had a great time altogether eating,chatting,joking & laughing while dining in our dinner. The next day was really not planned. Initially I'm just suppose to meet Famie to pass his stuffs & spend the day with Gf but instead after I met her, we went windowshopping , had lunch at Long John Silver & also look around for Gf's mum pressie. After walking few shopping centres,we felt tired. So we sat at Takashimaya before Famie called me up as he is reaching town in less than 20minutes with Mat Zidane(Pinholes new drummer). We met them shortly after that & sat at Starbucks Paragon. Soon enough, Haffiz & Effa passed by & joined us. As per normal,we talked,gossips,jokes etc etc.. Fai dropped by for a short while during her break. Few hours passed, Taufik called. He's in Singapore the night before so he wanted to meet up along with his sweet gf Sarah,Sham K,Najib & Ishaaq. We had a great talk,joked etc etc too. Time flew quite fast & as Gf was kind & understanding enough, she told me to joined them as it was late already. Therefore I sent her to the road junction outside Cineleasure & hailed a cab for her. We then walked around, played @ arcades & soon enough we bumped into Zurin. While sitting around outside Starbucks Liat, Najib's brother treat us to Blended Caramels. Great drink! Afterwhich the guys wanted to meet up with Khuza & Azman to hang around, so I said goodbye to them cause I'm going to have another long day with my former colleagues the next day. Another great day today coming up! !